No happy ending story for home fans as all their shuttlers failed to reach final round yesterday, China fills 4 final berths, folllowed by Korea (3), Indonesia (2) and the one remaining slot going to India. The 7th seed Korean pair shows they’re capable to beat any pair as they did superbly to cope home favourite Fischer/Pedersen in straight-sets. After their painful losing in Sudirman Cup semifinal against Japan, Ko SH/Kim HN seems well improved, particularly their defense department. A third final in Superseries tournament for former world champion Ahmad/Natsir in this year as they lost to Zhang N/Zhao YL in All England and Korea Open. 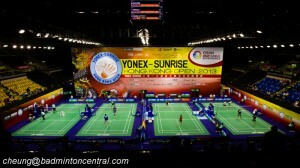 Last year beaten finalist, Indonesian pair has slight advantage to prevail but they should be wary to Korean darkhorse. It will be daunting task for the relatively new combination of Jung KE/Shin SC to topple reigning World and Olympic Champions Tian Q/Zhao YL. The Chinese pair is still solid despite only having participated in two tournaments in 2015 with good result: semifinalists in the All England Championships and gold medal at the Jakarta World Championships. No doubt, Tian/Zhao is trump card for China as their compatriots have had quite inconsistent performances against other pairs. China new sensation, Liu C/Lu K performance is beyond expectation here to knock out two high profile pairs en route to last round, both recent world champions Ahsan/Setiawan and local heroes Boe/Mogensen. Today they will challenge the top ranked Lee YD/Yoo YS who are the inform pair looking at their smooth progress in previous rounds including disposing of Fu HF/Zhang N yesterday in quick duration match. We’ll see whether the nothing to lose Liu/Lu can turn the tables against highly favoured Lee YD/Yoo YS. It is the second final for Li XR in this Superseries season after the Malaysian Superseries Premier last April. She will be up against Indian rising star Sindhu who defied all odds with a superb performance to knock out world champion Carolina Marin at last four. Sindhu won their last meeting at the World Championships quarterfinal. This tie is anticipated to be tightly contested with an equal chance for both players to top the podium. The Denmark Open is the last tournament won by Li XR, exactly a year ago when she was also carrying an injury. The resurgent Tommy Sugiarto cruises to final after stunned three seeded players at previous rounds, 5th seed Srikanth, 2nd seed Jorgensen and 7th seed Chou Tien Chen, all in two games and indicates he will pose dangerous threat for defending champion Chen Long who was pushed to the limit by Viktor Axelsen in last the four. The two-time world champion is not looking in top form during this tournament as he also dropped the first game against the resilient HKG player Wei Nan earlier.